Protoclassic, 100 B.C. to A.D. 250, from Colima, West Mexico. Seated upright with a nobly meditative expression, this lady holds her hands to her mid-section, wears a wraparound skirt which reveals a sculpted hollow area between the legs, and is adorned with a necklace which hangs down her back. Her ears are pierced and ornamented below the head covering which is uniquely and intricately decorated with black resist cross-hatching designs, which also appear on the headband and the left upper arm. She is painted overall in deep shades of reddish brown with black features. There are sporadic manganese oxide deposits mottled within the red patina. 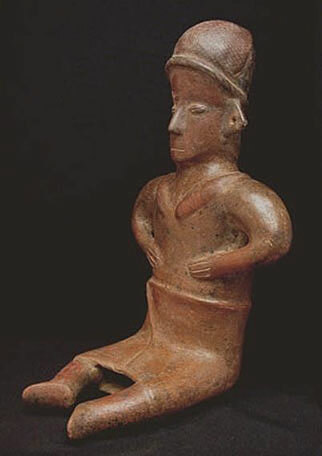 Provenance: Held in an old and distinguished private New York collection of Pre-Columbian sculpture for over 30 years. Condition: No repairs, restorations, cracks, or chips. This figure is in excellent condition.